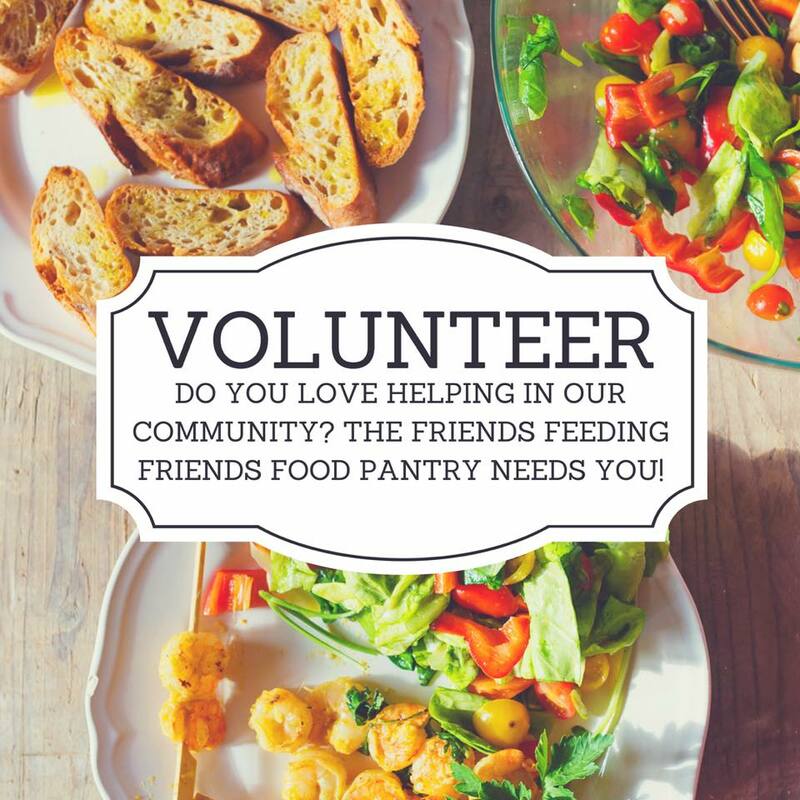 Are you planning a Food Drive to benefit FOM Friends Feeding Friends? As the weather cools down, we are thankful that donations are beginning to heat up. Friends of Mascoma Foundation (FOM) is currently in the process of supplying food for 30 Thanksgiving boxes for Indian River School and contributing to 50 Thanksgiving boxes assembled by the National Honor Society at Mascoma Valley Regional High School. Any needs beyond these boxes will be covered by the Mascoma Valley Ecumenical Council Thanksgiving Ingathering. FOM is acquiring the majority of the turkeys for the Thanksgiving Ingathering thanks to their partnership with the New Hampshire Food Bank and has facilitated the donation of 1800 lb. of squash and 450 lb. 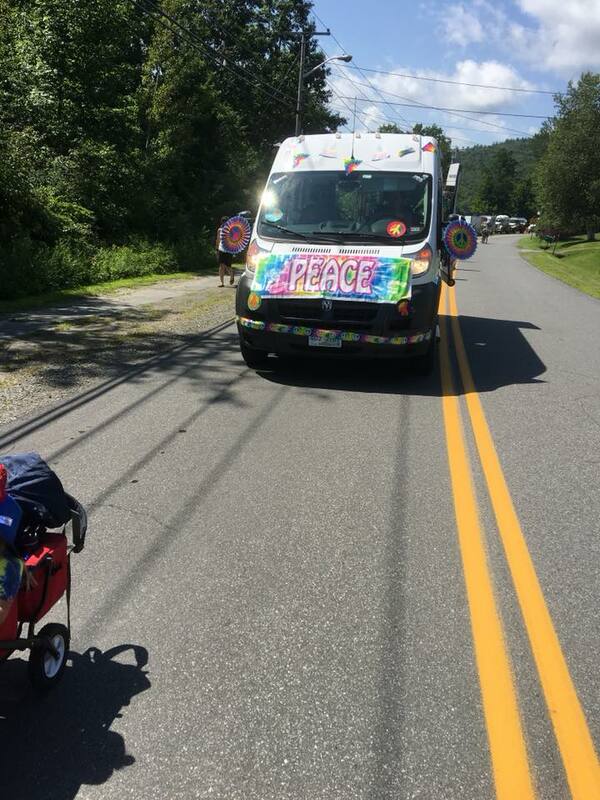 of potatoes from the Grafton County Department of Corrections Farm to the Ingathering. As soon a those 3 waves of Thanksgiving drive-related items are transferred, Friends of Mascoma is going to immediately dive into assembling items for the 100 boxes to be distributed by Mascoma Valley Emergency Services (Enfield, Canaan, and Grafton) as part of their Christmas Toy Drive giveaway to families in need. This happens at the beginning of December. Community Lutheran Church received seed funding from Thrivent Financial and quickly turned it into milk, cheese, butter, yogurt, baking mixes, frosting, and vegetable oil to kick of their Feed the Northeaster Challenge Food Drive. TDuring the month of October, they collected and delivered over 800 items to the Canaan Pantry and an additional $500 matching grant from Thrivent Northeast will be awarded to FOM soon. This $500 match from Thrivent will go a long way as Friends of Mascoma can purchase standard items through the NH Food Bank for about $0.10 per pound. $500 can turn into 5000 lb. of food for our community. Enfield-Mascoma Lioness also completed a recent food drive and will be sharing some of the donations with Friends Feeding Friends and other local food pantries. Watch for news on upcoming Stuff-a-Bus and NHS Food Drive, BSA Troop 44 Scouting for Food Camp Out, Community Balanced Life, and Thanksgiving Ingathering efforts to collect food for our neighbors over the next month as we approach the holiday season. Every donation is hugely appreciated and needed as FOM works to share resources throughout the Mascoma Valley. The ongoing food needs in our community remain critical. Please share the news about these important efforts to combat food insecurity in the Mascoma Valley with those you know. We are incredibly proud of the work Beth Felix, Kaylee Felix, and our many volunteers doing in our community! Foodie, the van, loaded with donations and ready to go! 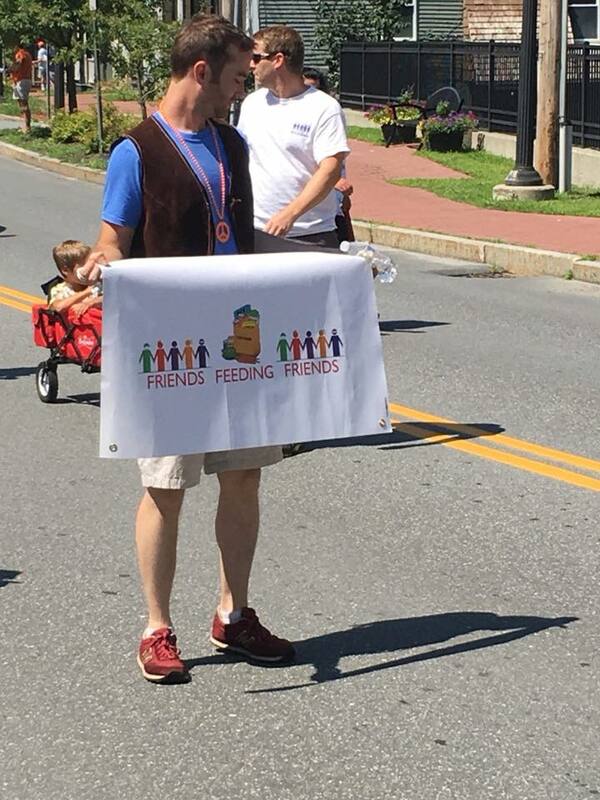 Friends of Mascoma Foundation is always happy to support our Mascoma Valley families! The Warm Winter Clothing and Coat Drive happens because of the generosity of our Mascoma residents who pay it forward. We are honored to have a board member like Beth Felix and her daughter, Kaylee Felix, who take on this project yearly together with a team of volunteers. Thanks to all of you who helped by donating and giving your time so this can happen. Spreading resources rather than discarding it is the way to go! Kaylee, an eighth-grader at Indian River Middle School, is happy to see how much of an impact the event has had since it began. For her, it’s all about hanging out and playing outside with her friends no matter the time of year. We are grateful again this year to Canaan, NH Fire and Emergency services for sharing the use of their gathering room with us. We look forward to seeing everyone next year. If you missed the giveaway and are in need of warm winter clothing, Friends of Mascoma shares items that do not find a home during our giveaway with the Canaan United Methodist Vestry for their Coats Plus program. Coats Plus also offers these items and many more, for Free to our community. Stop by and see what they have to offer. Please help us spread the word regarding the Mascoma Valley Ecumenical Council Thanksgiving Ingathering food baskets and LISTEN holiday baskets to both donors and Mascoma families in need. The deadline to submit forms for the Thanksgiving Ingathering is Friday, November 9, 2018 and the deadline for the LISTEN holiday baskets is Thursday, November 15, 2018. For your convenience we have converted the information to image files in this post. To download a PDF copy please visit our Friends Feeding Friends page. With sincere gratitude, we thank all the @Co-op Food Stores shoppers and members who “rounded it up” the month of September. This charitable program benefits 5 Upper Valley charities each month and is a great help to a small charity like us. Co-op Food Stores, you are awesome community partners! The @Upper Valley Humane Society brought their Mobile Pet Food Pantry to our Friends Feeding Friends Canaan pantry October 24. Our pantries do try to keep pet food available and the UVHS also has a pet food pantry at their site in Enfield. Pictured above is Charity Piper of UVHS, Lana Evans of FFF, Carolyn Cusick of FFF and Julia Murray of UVHS. Community organizations are stronger together! Realizing your kids grew 4 inches over the summer? Please hang on to those warm, winter clothes and layers in like-new condition and consider donating them to a neighbor in need. Don't panic if you need something outside your budget - there are always great finds. Each year Beth Felix leads the charge in collecting Warm Winter Clothing & Coats for children and families in the Mascoma District. Please reach out if you would like to donate clean, gently used items in excellent condition or new items. 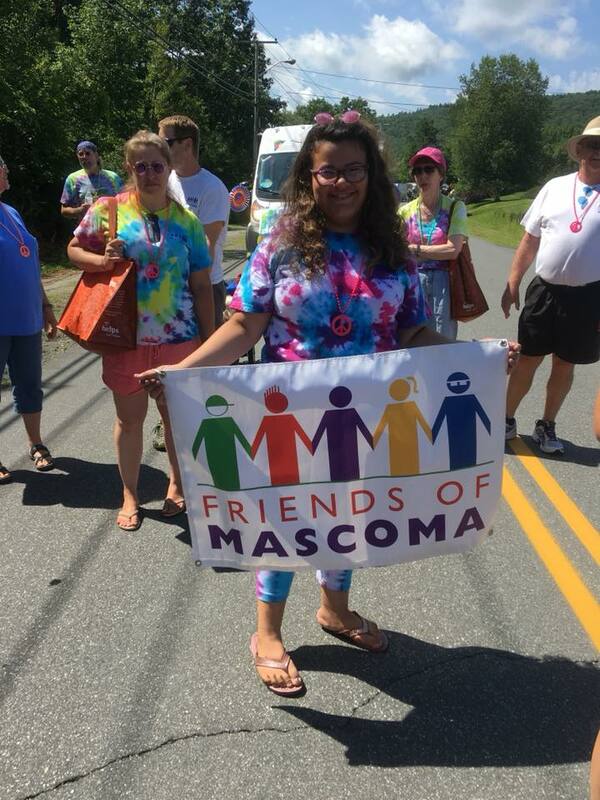 Call Beth at 603.306.6058 or email info@friendsofmascoma.org. WARM WINTER ITEMS AVAILABLE in infant through adult sizes! Bring your own bag to fill! Connecting Art with Food and Community Outreach! Meet & Greet on October 3, 6-7 p.m.
We are elated to report that our MVRSD Sports department headed by John Kelly participated in the New Hampshire Food Bank sponsored food drive with WMUR-TV and the NHAA. On September 22, 453 pounds of food was donated and 175 pounds of food was purchased with WMUR-TV donated gift certificates to Hannafords. This was a grand total of 628 pounds of food which was given to the MVRHS Pantry. Way to go, caring community! The Pennies for Change Program is a charitable giving program at the @Coop Food Stores. Customers can donate their change to the designated community partners by rounding up to the next full dollar amount. During the whole month of SEPTEMBER, FOM will receive 30% of the collected funds. This is such an awesome program that last year we were awarded almost $6000 during the month of July. Please think of participating when shopping. There are 4 other charities benefiting so it is all Win! Win! Tell your cashier to "round it up"! Every penny makes a difference. Friends of Mascoma Foundation will be co-hosting a Meet & Greet in October. This is an opportunity for members of our community to meet new SAU office employees. Each year Beth Felix leads the charge in collecting Warm Winter Clothing & Coats for children and families in the Mascoma District. Call Beth at 603.306.6058 or info@friendsofmascoma.org. Get in touch now if you want to donate clean, gently used items. Overrun with fresh-picked, delicious garden veggies? 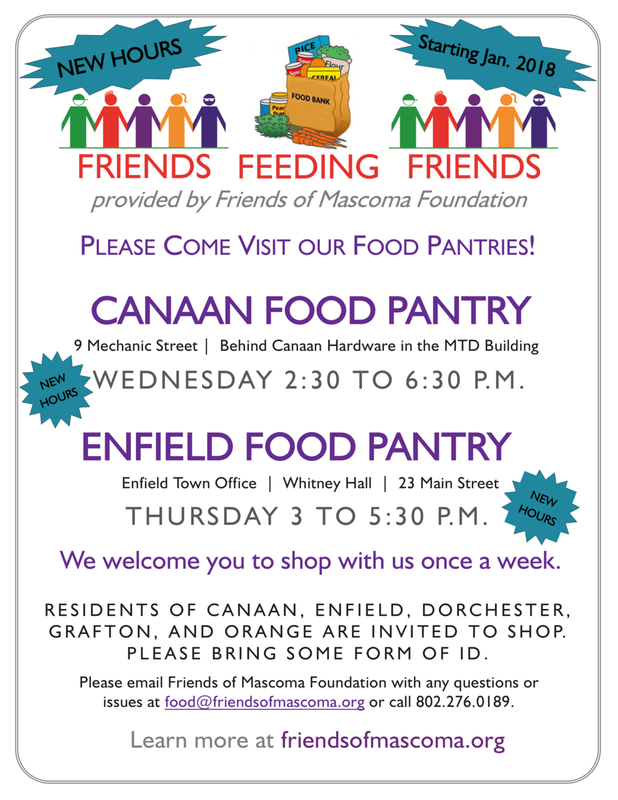 Donations are gratefully accepted during regular pantry hours at the Friends Feeding Friends Food Pantries (see poster below). Know a family in the Mascoma Valley who needs additional food resources? Pass our pantry information on! Friends Feeding Friends also generously shares resources with the pantry operated by the high school. Want to volunteer? Please email food@friendsofmascoma.org. Thank you to all who have donated this harvest season! 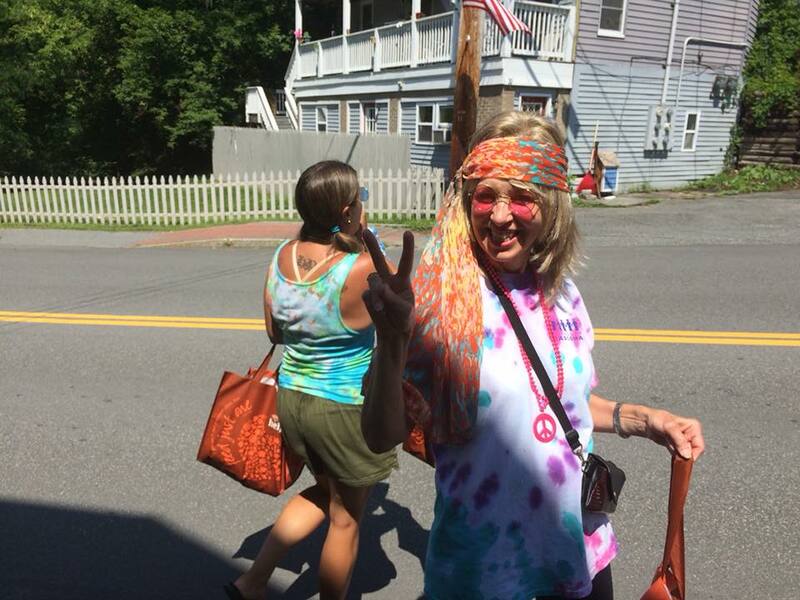 FOM got a little groovy at the Decades-themed Enfield Old Home Days Parade. 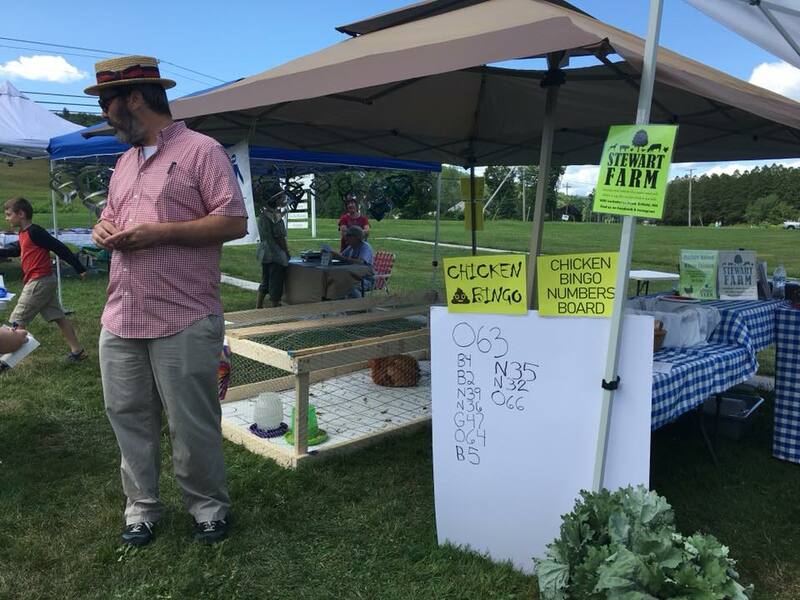 Our test-run of Chicken Poo Bingo at the Sunday EOHD Country Fair proved to be highly entertaining for children of all ages. Watch for this event to return next year with higher stakes. 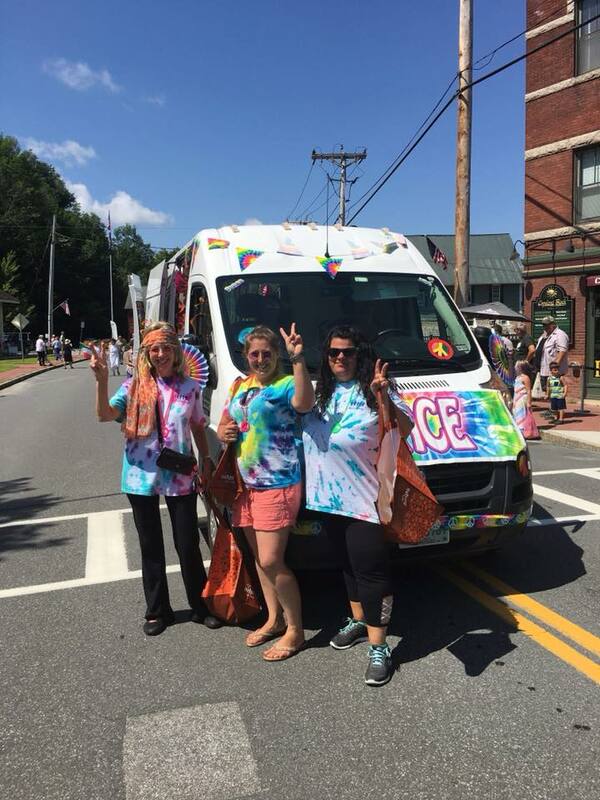 Thank you to the Enfield Old Home Days Committee for hosting and to our many awesome volunteers for making the weekend events fun! 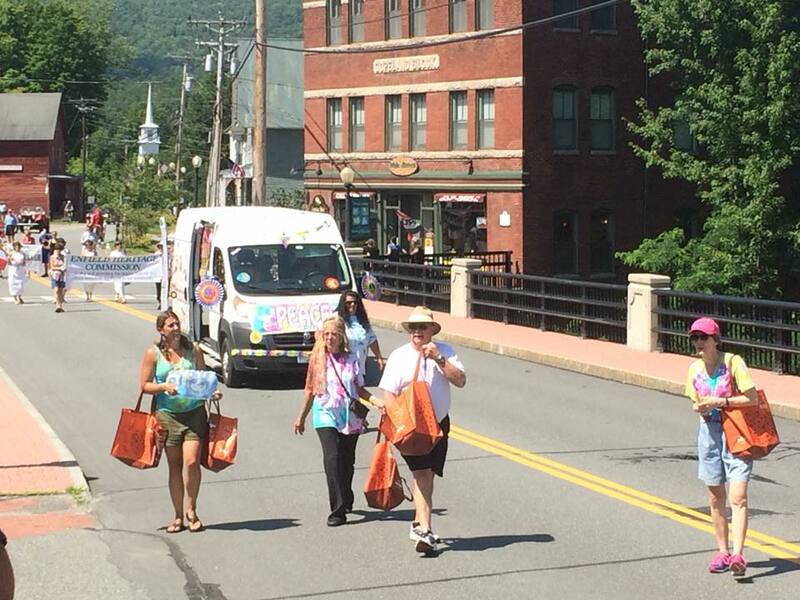 Another fast-paced and lively Canaan Old Home Days Parade. 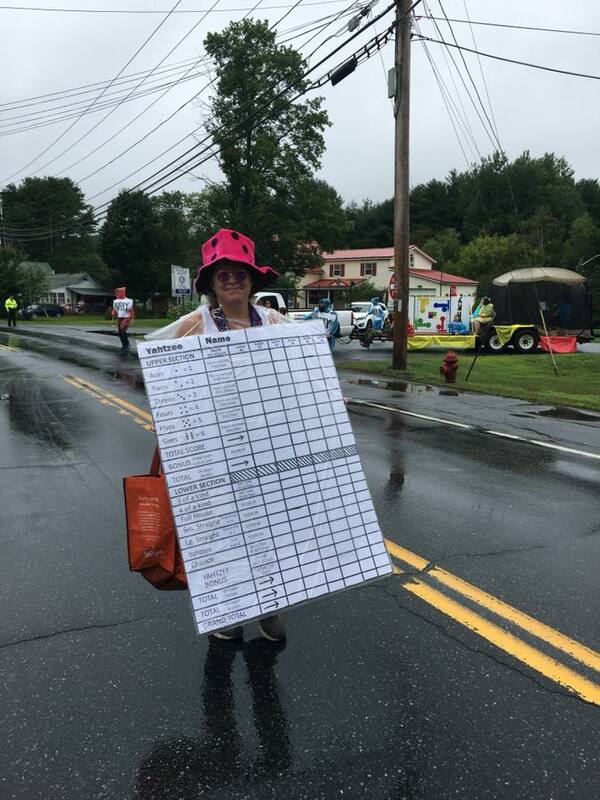 A bit of rain could not damped the FOM COHD Parade Crew's spirits! Our volunteers handed out plenty of candy and POP Bucks for Vital Communities. to be used at the local Farmers' Markets. 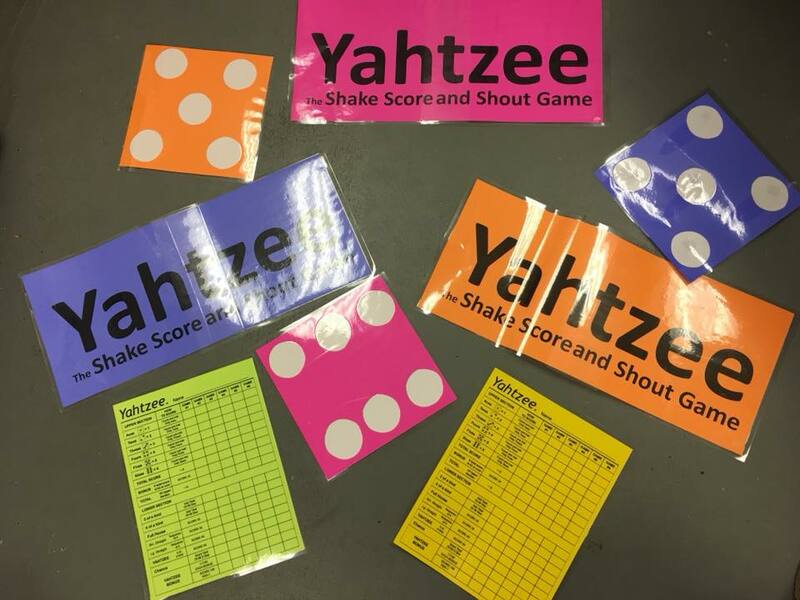 See a short video of our Yahtzee parade entry on our Facebook page. We even won a few prizes; Lana gets credit for the great idea! Many thanks to the Canaan Old Home Days Committee for hosting such a fun event and to our volunteers for decorating another winning entry! See you next year! We even won a few prizes. Mini-Grant Deadline - October 1st! The 2018-2019 school year is off to a hot and sweaty start, but that has not diminished the enthusiasm we see from educators in our district! Our next mini-grant deadline is October 1st, be sure to remind the MVRSD employees you know about this exciting program. More information and the application can be found at: http://friendsofmascoma.org/mini-grants/. Senior awards night is one of our favorite nights of the year! The energy and support from family and friends during the ceremony is always incredible. This year we are pleased to announce we awarded the scholarships listed below. These scholarships were made possible by our generous donors and we thank everyone for their support. WE ARE THANKFUL TO OUR DONORS WHO PARTICIPATED IN NHGIVES THIS YEAR TO HELP US REPLENISH OUR SCHOLARSHIP FUNDS FOR 2019. WE RAISED OVER $20,000 IN 24 HOURS. SEE THE REPORT OF HOW WE DID FURTHER IN THIS NEWSLETTER. 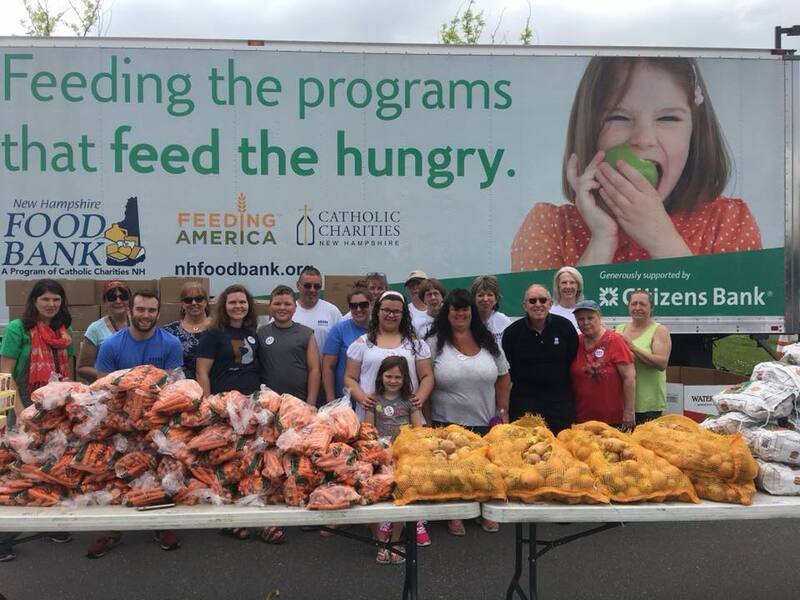 The New Hampshire Mobile Food pantry visited the Mascoma Valley on June 2. These are all our awesome volunteers who came to help distribute food to any families or residents who stopped by. We are grateful for all the help our Food Bank has given us. Please think of our Food Insecurity Program in your charitable giving.